On the American Lawyer's list of the top U.S. law firms for 2012 by gross revenues, Florida-based GrayRobinson moved up to number 179. 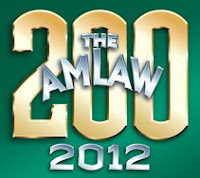 See The 2012 Am Law 200. In other news, The Florida Current reported that GrayRobinson was a top-four Florida lobbying firm based on reported revenues for 2012 1st and 2nd quarters. Perry Cone, the author of TallyInsLaw.com, practices Insurance Regulatory, Corporate, and Government Law in the Tallahassee office of GrayRobinson.